Don't you dare try to bake me a pie! Mike Binder is a filmmaker interested in telling stories about identifiable people dealing with identifiable problems. In films such as The Upside of Anger, Indian Summer, and Reign Over Me, he has displayed an empathetic desire to understand humans at their weakest moments, to see what makes them tick and what allows them to keep going. In an age where many viewers want the blow-you-away-with-something-amazing-for-every-second approach of someone like, say, Christopher Nolan, it’s nice to know that Binder is over to the side, keeping it real. His latest, Black or White, continues this tradition, tackling no less an issue than race. But while there is plenty to admire in the attempt, the movie ultimately takes on too much all at once. Kevin Costner plays Elliot Anderson, whose wife Carol (Jennifer Ehle, seen in dream sequences) has just died in a car accident as the movie begins. In deep grief, he turns to alcohol for solace. But that’s not his biggest problem. Elliot is left with his biracial granddaughter Eloise (Jillian Estell), whom he and Carol have raised ever since their daughter died during childbirth and the girl’s father, Reggie (Andre Holland), went to jail on drug charges. Believing that Elliot is in no shape to parent solo, Eloise’s paternal grandmother, Rowena Jeffers (Octavia Spencer), decides to file for custody. 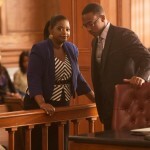 Her lawyer nephew, Jeremiah (Anthony Mackie), takes the case, and the struggle begins. Is Eloise better off with the drunken, but financially successful, widower who has had her since birth, or with an extended family living in the less affluent South Central section of Los Angeles, where her crack-smoking deadbeat dad might have access to her? The intentional irony of Black or White is that it’s not really concerned with either of those things; it’s concerned with the gray area in between. Both Elliot and Rowena have their strengths and weaknesses. The screenplay adds complication upon complication for the characters in order to make the gray areas even grayer. Among the elements introduced are Elliot’s alcoholism, his possible racial insensitivity, Reggie’s questionable sobriety and half-hearted attempts to reconnect with his daughter, Rowena’s refusal to acknowledge the damaging nature of her grown son’s addiction, her inability to afford the expensive prep school Elliot has been paying for, and appropriate child care for the girl. And that’s only part of it. Black or White works so hard to show the gray areas that, after a while, you begin to wonder whether Eloise might not be better off somewhere else altogether. While many of these issues are interesting — and all of them certainly valid — tossing them into the same screenplay means that the film is never able to explore any of them as deeply as necessary. Similarly, so many things cannot be satisfyingly paid off all at once. As such, Black or White falls apart substantially in its final act. A climactic confrontation between Elliot and Reggie is laughably overwrought. The scene becomes almost comical in the way it tries to manufacture grand, symbolic drama. (It even finds a way to get one of the characters into a near-death situation.) This needlessly heavy-handed sequence is oddly followed by one of those annoyingly quirky movie courtroom scenes where people say and do things that would never be allowed in a real court of law, but which are allowed by the cinematic judge because, doggonit, they’ll lead to a happy ending. It’s additionally worth noting that, as the battle between the adults takes place, Eloise becomes lost in her own story. What she wants and how she’s impacted by the people in her life fighting over her is curiously ignored. Kevin Costner and Octavia Spencer both do fine work here, to be fair. The former captures the toxic way Elliot’s grief, resentment, and fear combine to foil his best intentions, while the latter gives Rowena a credible mixture of determinism and denial. Scenes between them often have a ring of truth. The supporting actors are solid, as well. Young Jillian Estell, meanwhile, delivers a nice, unforced performance as the little girl whose emotional and physical welfare is at stake. One gets the feeling that, had the film given her more to do, she might have been up to the challenge. Black or White deserves credit for even trying to examine the issue of race in a serious way. Some of the ideas it introduces are undeniably affecting and thought-provoking. The two-hour running time flies by, even if the film never quite hits the bull’s-eye, simply because it’s hard not to engage with the topic. Mike Binder has made a very sincere movie with lofty ambitions. You have to respect that. But Black or White comes at the issue from so many angles simultaneously that the overall impact is muted.